The versions supplied to the Japanese military are the 'Super YS' with uprated engines. Current planes are in a very boring two color grey scheme. These aircraft replaced the EC-46s that were used for the same task. This is one of those kits that often flies under the radar of most modelers, and it is a shame as it builds into an excellent model. I've built the ANA airliner version and found it to be well thought out. This one is a special boxing that includes not only weights for the nose, but also several new pieces produced in resin for all the various lumps and bumps that festoon this particular variant. Unlike many kits, this one comes with a display stand, for which a hole will need to be opened in the fuselage halves prior to construction. Also one will need to cut away the various antennas already molded on the fuselage that are not pertinent to this version. There is a cockpit of sort with simply some seats molded to a forward section. It is to the back of this section that the weights are attached in a small cage made specifically for this purpose. 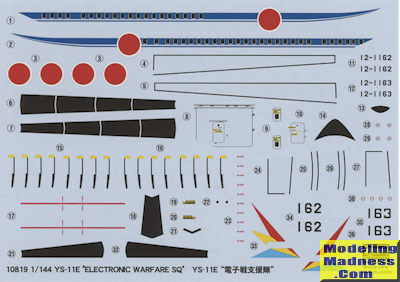 There are no windows molded on the fuselage to allow the kit to be used for a variety of airlines and military liveries. Engines are each three pieces and hold poly-caps for the props. Wings are an upper and lower section on each sied and include a rudimentary wheel well. The engine nacelles simply slide onto the front of the wing. Once the wings and the tail planes are attached to the fuselage, it is time to start attaching resin bits. 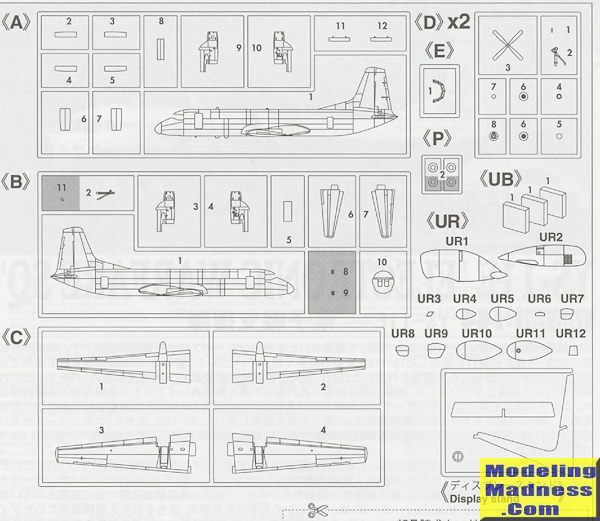 These are all over the upper and lower as well as the side of the fuselage and the instructions show exactly where each one fits. One can build the airplane in flight and separate closed gear door assemblies are provided for this. Those wishing the plane on its wheels have nicely molded gear on which to place the airplane. The last thing one does is insert the windscreen and the props. Instructions have detailed notes regarding the mods and placement of the resin bits. There is the usual Gunze paint reference and two markings options are provided. These differ only in the serial number and in the way the nose radome is painted. The decal sheet includes wing walk markings, de-icing boots and even prop decals. It is superbly printed and should work as well as any aftermarket sheet. This boxing is of the plane when it was still in its bright livery with the colorful tail markings. If you haven't figured it out already, this is a very nice little kit. The resulting model is a fairly good size and thanks to the colorful markings, will make a nice addition to your display area. Thanks to www.hlj.com for the preview kit. Get yours at this link.